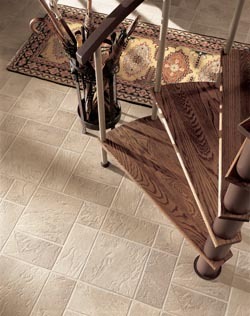 Enhance the look and function of any room in your home with luxury vinyl flooring in Yorkton, SK. This sophisticated and durable new flooring material is sure to bring any home’s appearance from old and outdated to classy and modern. When you’re ready to update your home, visit our showroom to discuss your project with our knowledgeable staff. We’re always ready to help you find the perfect luxury vinyl tile to suit your needs. When it comes to resilient flooring, there is a variety of materials and styles to choose from. Our flooring showroom keeps many options in stock and is always able to help you find what you’re looking for. From vinyl and cork to rubber and linoleum, we carry a full range of resilient flooring options. Enjoy more time with your family or hobbies and less time cleaning your floors when you choose resilient flooring for your home. Whether you’re redesigning your kitchen or creating a completely different style for your living area, resilient floors are the way to go. Available in many different materials, these floors are capable of withstanding daily heavy foot traffic, scratches, stains, and water damage. They’re easy to clean and don’t require intensive cleaning procedures like other flooring types. Do you love the look of natural stone, ceramic, or hardwood floors? Luxury vinyl tile and plank flooring offers the sophisticated look and atmosphere offered by natural materials, but costs less and requires less maintenance. Luxury vinyl flooring is perfect for any room in your home, especially rooms with frequent spills or high moisture levels like the kitchen, laundry room, bathroom, or entryway. Their water resistant quality makes them perfect for these rooms and their versatile range of appearances means they’re also suitable for any other room. Protect your new investment by scheduling luxury vinyl flooring installation with skilled professionals. We make it easy and pain-free to get your new flooring installed quickly and properly. Our installation contractors fully remove your old flooring materials, prepare the subfloor, and properly install your new flooring so that it is sure to last for many long years. By scheduling installation with trained professionals, you’re able to increase the lifetime of your flooring and ensure that you’re covered by any relevant warranties. Contact us when you’re in need of top quality resilient flooring. We’re proud to serve clients in Yorkton , Wroxton, Willowbrook, Kelliher, and Ituna, Saskatchewan, as well as the surrounding areas.